Options: See In-Stock Items for available colors. These mesh-style shopping bags are attractive as well as practical. Both lightweight and strong, they can be machine washed and dried. They stretch to hold several items, but are compact to carry. Let me know if you have a favorite color. 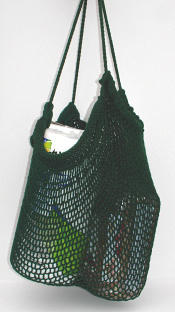 The yarn I use to knit these shopping bags comes in a wide variety of colors, both solid shades and variegated colors. See below for some of the colors available. A durable acrylic yarn keeps these shopping bags looking great even with constant use. They can be machine washed and dried as often as necessary. The bags stretch to hold several items, but when emptied will spring back to their original size and shape. There is no attached closure to break or wear out, so you can use your shopping bags for years. The drawstring is a continuous loop, so it can't be pulled out by accident. 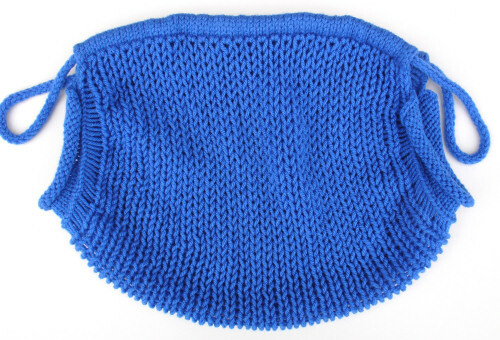 Because they are knitted in a mesh stitch, the shopping bags are best suited for larger items. They're wonderful for produce, because they're so easy to wash and dry. Another natural use for this style bag is at the beach. It will easily stretch to hold a beach towel, sunscreen, and a bottle of water. If it gets wet and sandy -- no problem! Just throw it in the washer and dryer along with your beach towel. These shopping bags also come in handy for trips. Use them for items you don't want to get lost in your luggage. They also work nicely for carrying dirty laundry home. Because air flows through the holes in the mesh, you don't have to worry about odors or mildew building up.